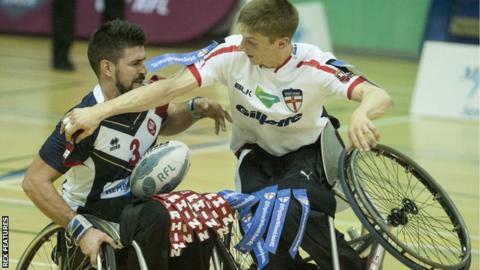 A late converted try gave France a 38-34 win over England in the Wheelchair Rugby League World Cup final. England led by two points going into the final two minutes only for Nicolas Claussels to score, with France captain Cyril Torres converting. France then withstood near constant England pressure in added time to retain their title. This was a repeat of the 2013 final, in which France also beat England, who had won the inaugural event. Wales, who had threatened to leave the pitch in their final match after one of their players suffered seizures due to flash photography, finished fifth overall after a 66-45 victory over Spain on Thursday.